White Man’s Heaven explores the racial dynamics in the Ozark Mountains, circa 1900. The author studies Arkansas and Missouri villages (focusing on Springfield, Missouri, the largest community in the region) and contends that the lynching and expulsion of blacks in the region resulted from varying communal complexities. A prevailing Ozark culture of violence extant since settlement, political competition in which African Americans often determined close elections, economic uncertainty that exacerbated class conflict, cultural anomie as New South mentalities rocked the Ozarks, and regional racism endemic since the antebellum era spawned the violence that was perpetrated on a miniscule black Ozark population. Kimberly Harper reminds us that the prevailing lynching narratives constructed by W. Fitzhugh Brundage, Edward L. Ayers, Stewart Tolnay, E. M. Beck, and Michael J. Pfeifer are critically important, but they often overlook contingencies that a microscopic view such as this discerns. Harper finds multiple causes, and heterogeneous black and white communities reacted uniquely. Mobs were formed in Pierce Cityand Springfield after assaults on young white women, in Joplin after the murder of a policeman, and in Harrison after an assault on workers. In Pierce City, Joplin, and Harrison, scores of blacks fled after the mobs burned their homes, but in Springfield, white government officials quickly formed patrols after the lynching to restore order and prevent a mass exodus of blacks. In Pierce City, Joplin, and Harrison the judicial system failed to bring mob members to justice; in Springfield one leader was indicted and tried, but a hung jury signaled the futility of such cases. For this well-written and creatively researched work, Harper mined newspapers, court records, pardons, city directories, and even the pen-pal exchanges between a northern and a southern adolescent. Photographs and sketches of the mobs keep their grisly work before the reader’s eyes. Eschewing the sterility of many scholarly monographs on lynching that become anemic exercises in finding a new paradigm where no human is really burned, mutilated, or dying, Harper never forgets the Conradian horror involved. Review originally published by Journal of American History, Volume 98, Issue 3, Pp. 851 – 852. Re-published by permission Oxford University Press. The following review first appeared in the February 2012 issue of the Journal of Southern History. It appears here with the express permission of the Journal of Southern History. Just four days after the U.S. Supreme Court issued the Brown v. Board of Education (1954) decision, the school board of the Ozarks mountain town of Fayetteville, Arkansas, voted to admit seven black to the high school, beginning in the fall term. Fayetteville’s school district thus became the first in the states of the former Confederacy to authorize compliance with Brown. The contrast with the fierce resistance to school desegregation that occurred in 1957 in Little Rock was striking. Anyone, however, who concluded that racial attitudes were inherently better among whites of the mountain South might well be disabused of the idea after reading this excellent study by Kimberly Harper. She examines in detail the circumstances that led to the lynching and expulsion of African Americans from five towns in the southern Ozarks between 1894 and 1909: Monett, Pierce City, Joplin, and Springfield in southwest Missouri and Harrison in northwest Arkansas. One of those circumstances may have been the culture of the region itself, where traditions of the frontier lingered, including “folkways of extralegal violence, honor, and vigilantism” (p. 1). However, modernity was intruding into the southern Ozarks through expanding railway lines, new railway towns, and lumber and mining camps and settlements. Concomitantly, there arrived groups of transient laborers given to violent behavior. Violence, however, was not restricted to these groups. Both middle- and working-class whites, from the towns and from the surrounding countryside, participated in the bloodlettings. In numerous instances they and their black victims had resided together in the same communities for years. Why then, one wonders, were there sudden eruptions of white racial hatred? Echoing an idea first advanced by Howard N. Rabinowitz and others, Harper hypothesizes that part of the explanation for such racial explosions may be generational. Younger blacks not conditioned by the experiences of slavery may not have abided by the old racial etiquette; if so, some whites no doubt would have seen them as insolent and rebellious. Further inflaming local whites were the perceptions, correct or not, that black-on-white crime rates were increasing and that the “local judiciary was too weak and ineffective to uphold the law,” in part because of the alleged refusal of blacks to testify against members of their own race (p. 39). In the minds of whites, therefore, even blacks who were not themselves accused of crimes shared in a kind of collective guilt, making it only right and proper to expel all blacks from their midst. Furthermore, local political conflicts and competition enhanced the feeling among some whites that mass expulsions of African Americans were needed and desirable. Since relatively few blacks resided in these Ozark locales and for the most part occupied only menial and marginal positions in the workforce, they could be driven out with little adverse economic impact. Harper very effectively weaves into her narrative numerous contemporary newspaper reports and eyewitness accounts. While at times she might have better related local happenings to broader developments and changes in racial attitudes and policies that were occurring throughout the nation, this shortcoming is compensated for by the vividness and sense of immediacy that she brings to the local events she describes. An invaluable work, White Man’s Heaven: The Lynching and Expulsion of Blacks in the Southern Ozarks, 1894-1909 supports and importantly expands on recent studies of sundown towns and racial cleansing by James W. Loewen and Elliot Jaspin. Harper’s study also complements and reinforces the earlier investigations of Gordon B. McKinney concerning the prevalence of racial prejudice in the eastern Appalachian South. The notion that whites living in the southern highlands have been somehow immune from the racism and intolerance that are an undeniable part of American and southern history is belied by all these studies. The following review first appeared in the Summer 2011 issue of the Arkansas Historical Quarterly (AHQ). It appears here with the express permission of the Arkansas Historical Quarterly. 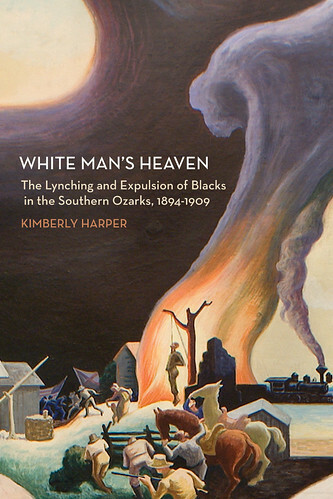 In this powerful and important book, Kimberly Harper tells the story of how white people violently expelled African Americans from the southern Ozarks in the first decade of the twentieth century. White Man’s Heaven uses a series of four interlinked case studies to provide a nuanced account of what can only be called a pattern of racial cleansing in Southwest Missouri and Northwest Arkansas. The first case study examines the 1901 lynching in Pierce City, Missouri, of three African-American men implicated in the murder of a white girl and the subsequent armed assault on the black section of town. “The refugees ran for their lives,” Harper writes, “as the violence raged…A brave few returned only to be told that they must leave Pierce City and never return on pain of death” (p. 29). Harper concludes that the events in this Lawrence County town “served as the turning point for the rest of the southern Missouri Ozarks, confirming the acceptability of lynching and expulsion” and setting a pattern that “was repeated over the next decade across southwest Missouri and in an adjacent county in Arkansas” (p. 41). The events in Pierce City had demographic and atmospheric effects on communities nearby that fueled the spread of violence. Many of the people who fled Pierce City settled in Joplin, Missouri, where in 1903 a white mob lynched a black man accused of murdering a police officer. The Joplin mob, inspired and perhaps joined by members of the mob of 1901, went on to attack and burn the African-American neighborhood in the city. Dozens of black families, including some of those displaced residents of Pierce City, left in fear of their lives. These acts heightened racial tensions throughout Southwest Missouri, and led to increasing violence toward blacks in Springfield, Missouri, the region’s largest city. There on the night before Easter 1906, a white mob numbering in the thousands lynched, burned, and mutilated the corpses of three black men following claims by a white woman that two black men had attacked her. Although the Missouri National Guard prevented the mob from marauding through a black neighborhood, the triple lynching ended African-American involvement in local politics. “While blacks were not expelled from Springfield after the lynchings,” Harper concludes, “local politics and government were cleansed of African Americans…[who] would not hold office again in Springfield until the end of the twentieth century.” (p. 234). Harper rounds out her account with a brief chapter on the expulsion of black residents from Harrison, Arkansas, in 1909. White Man’s Heaven is exquisite story-telling. Informed by rich local newspaper coverage, court records, and biographical detail, Harper’s account is powerful in its description of the racial violence and aftermath, and evocative as a sketch of the political, social, and economic history of the southern Ozarks. Explaining why lynching became expulsion in the Ozarks, Harper cites “a culture of violence” that encouraged vigilante action when people perceived threats, in this case from African Americans at a time of rising white supremacist sentiment nationwide (p. 254). Local politics also contributed. Black voters often turned elections in the Ozarks where Democrats and Republicans were evenly matched. But, as Harper points out, neither political nor social anxieties are enough to explain the drive from racial cleansing. Since African Americans were a small minority of the population, and thus economically marginal, Harper explains, “black communities could be driven out with little to no impact on the regional economy” (p. 255). Ozarks lynch mobs, once inflamed, had little to restrain their wrath. What Harper has done in this book is to throw open an ugly history that many people in the region would be content to leave forgotten, even though it is still there in local memory and hushed folklore. It happened in my hometown, Mount Vernon, the seat of Lawrence County, Missouri, and the physical ruins of the black community that was destroyed, probably following the events in nearby Pierce City, are still there, hidden in the woods near Interstate 44. No one in town talks about those violent events, and you could not find the place now unless you knew where to look. But that history cannot be forgotten or ignored any longer. Harper’s book is an important contribution for specialists in the field, but it is also essential reading for anyone who lives in the southern Ozarks. The story she tells of “a dark mark upon the land yet to be removed” demands a reckoning (p. 256). The following review of White Man’s Heaven appeared in the June 2011 issue of the American Historical Review published by the University of Chicago Press. This review appears in its entirety with the express permission of the American Historical Review and the University of Chicago Press. In the historiography of racialized mob violence in the United States, case studies have a worthy purpose. At their best, they provide thick descriptions of the social dynamics and turmoil in localities or subregions that gave rise to violence, and, with their attention to narrative, they are able to reveal the impact of that violence on individual lives and communities. Local studies can thus serve as useful counterparts to broader studies of lynching that are more interested in locating patterns of violence across local, state, and regional boundaries. Kimberly Harper’s new book is just that kind of valuable local study. Harper details a series of violent acts perpetrated against African Americans in the Ozark region of southern Missouri at the turn of the twentieth century. She focuses on several lynchings and riots in Pierce City, Joplin, and Springfield, using news accounts, court records, and census data to elucidate what caused these outbreaks. In doing so, she provides support for the arguments of scholars like Edward Ayers, Fitzhugh Brundage, and me, who have attributed the surge of lynching at this time to wider social transformations that many counties and towns were experiencing in the late nineteenth century. In particular, the expansion of markets and industry brought an influx of black labor into growing towns, which whites believed threatened the stability and safety of their communities. These changes disrupted traditional social arrangements and racial hierarchies, generating a white backlash that all too often took violent form. Harper finds that the localities she studied fit this general pattern. Moreover, she supports recent scholars who have argued that most lynchings were not directly motivated by economic concerns. The mobs in her study were dominated by men in the working or middle classes rather than the poorest of citizens. In other words, they were not laborers who were in direct economic competition with black workers. By focusing on the Ozark region, Harper also adds to our understanding of regional patterns of lynching. Scholars have noted that, although Mississippi, Georgia, and Texas experienced the most lynchings in this period in terms of sheer numbers, border states such as Florida and Kentucky saw the greatest numbers of lynching relative to their black populations. The rapid changes these states faced in the late nineteenth century, including a sizeable increase in their black populations, led to greater social turmoil compared to Deep South communities in which racial hierarchies were more firmly entrenched. Harper’s Ozark towns seem to confirm this thesis. Southwest Missouri had only been sparsely settled before the Civil War, and during the war it remained largely Unionist. But as Confederate veterans and ex‐slaves began settling there after the war, the region became “a cauldron of racial disharmony” (p. xvii). The Unionist roots of the region also meant that the Republican Party remained strong there in the early Jim Crow era, a fact that had deep ramifications for how the lynchings Harper discusses played out. Most significantly, in several cases, mob members were tried in court. In Pierce City in 1902, for instance, the families of two lynched men brought a civil suit against members of the mob. Although they lost the suit, that they were heard in court at all was quite extraordinary and belies any conception that, at the local level, African Americans remained passive to the violence committed against them. In Springfield, twenty‐two men were indicted, and two stood trial, for the lynching of three men in 1906. Although the men were released after a hung jury, Harper suggests that the influence of the Republican Party there allowed for more complex public and legal responses to lynching. That influence also meant that African American leaders had comparatively more authority, and black citizens felt relatively more emboldened, than in other regions of the country. Whatever power African Americans had, however, was limited. In addition to lynchings, Harper examines the forced expulsion of black citizens from Ozark towns, sometimes following a lynching or in response to crimes against whites allegedly committed by blacks. While she does not pay as much attention to expulsions as the book’s title would suggest, this aspect of her study is the most original, since little has been published on this topic. Although in her introduction Harper lays out her central conclusions about racial violence in this region, most of the book is narrative driven. Once she gets engrossed in her narrative, Harper often misses the opportunity to draw out the implications of the stories she is covering, especially regarding cases in which white responses to crime did not end in extralegal violence. Nevertheless, her book provides a cogent and illuminating contribution to the burgeoning scholarship on lynching. © 2011 American Historical Association. All rights reserved. “Kimberly Harper (MA 2007) began her work on racial violence and ethnic cleansing in the Ozarks in a Department of History research seminar in spring 2006. Her paper blossomed into a master‘s thesis, supervised by Professor Patrick Williams, which, in turn, provided the core of a book White Man‘s Heaven: The Lynching and Expulsion of Blacks in the Southern Ozarks, 1894-1909, newly released by the University of Arkansas Press.